Recommended use for children 3-7 yrs of age. This bench is solidly constructed, weather resistant, and very durable. Children will enjoy having their own bench that provides a more comfortable and suitable space indoors or out. This lightweight furniture allows easy movement from room to room while still providing perfect seating for activities of all kinds. PERFECT SIZE FOR KIDS - Bench comfortably seats two with sturdy frame rated for up to 120lbs. Measures 35" Length, 25" Tall and 19" wide. Bench is lightweight and easy to trasport while being very comfortable for children. NO ASSEMBLY REQUIRED - Kids bench comes fully assembled and pretreated to be durable in any weather. Made of solid, furniture grade, yellow pine, with rust resistant fasteners for maximum life. USE IN MANY PLACES - Whether it's a playroom, classroom, bedroom, porch, or patio this bench allows kids to have a place of their own. Take it camping, on a picnic, or even use as home decor in a mudroom or garden space. 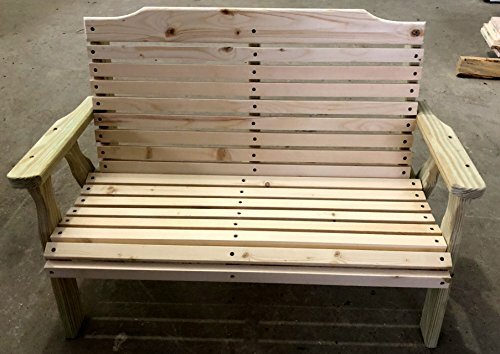 EASY TO CUSTOMIZE - If the all natural wood appearance isn't your taste this bench can easily be painted or stained with virtually no prep work. Add cushions or pillows for more decorative comfort. HANDCRAFTED IN THE USA - Each bench is carefully crafted and not mass produced. All surfaces are safe and sanded smooth. All materials are eco friendly and sustainably sourced. If you have any questions about this product by Crossroad Sales LLC, contact us by completing and submitting the form below. If you are looking for a specif part number, please include it with your message.